A Girl & Her Food: Help Donate Pasta to Northern IL Food Bank #RanaRavioliChallenge for National Ravioli Day! 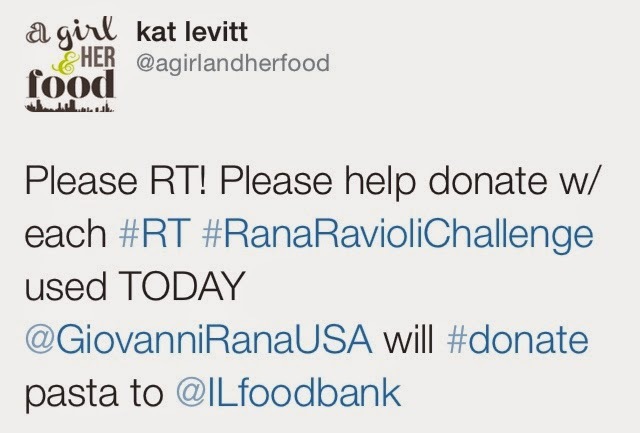 Help Donate Pasta to Northern IL Food Bank #RanaRavioliChallenge for National Ravioli Day! When Giovanni Rana asked me to help in a day-long social media celebration of ravioli and charitable giving today as it's National Ravioli Day! Giovanni Rana, synonymous with authentic, Italian pasta, is partnering with your local food bank to fight against hunger and encourage spending time with family and friends during the #RanaRavioliChallenge. Do you know that 1 out of 5 people are hungry?? I am VERY lucky to have every meal, every day provided. Please join me help solve hunger by simply using a hashtag and Rana will donate pasta to the Northern Illinois Food Bank. I ask you today to head onto your social media platforms (Instagram, Facebook and Twitter and use the hashtag #RanaRavioliChallenge and Giovanni Rana will donate 1LB of pasta to the Northern Illinois Food Bank!